Cloudphotoeditor is a free online animated gif creator that offers you variety of photo effects, animations, glitter stamps, frames, etc. to create stunning photos. You can either opt to upload photo from the computer or simply provide the URL of the same, to perform various edits and actions. It lets you upload image up to 4 MB in size. It supports JPG, GIF, and PNG image formats. This free online photo editor also lets you create animated gif slideshows. For that, you can upload up to 10 photos. It provides you effects like PhotoFunia and offers you variety of frames is similar to that of FreeOnlinePhotoEditor I reviewed earlier. The only flaw with this free graphic editor is that, it adds a small watermark at the bottom of the final image. This free online photo editor also provides embed code that you can use to embed image in any webpage or forum. It also lets you send via email and at the same time allows you to save the edited image to your computer. How To Add Effects, Animations, Frames, Glitter Stamps Using This free Photo Editing Website? Cloudphotoeditor can be accessed by the link provided at the end of this article. As soon as you click on link, it soon redirects you to the page where it displays all the options on the main homepage. From there, you can select the action that you wish to perform on your photos. I chose Animation, as I love to create animated GIF images. It then provided me variety of animated effects, that I could easily add to my images. From the Image Panel, you can upload any Image from your computer. You can adjust zoom and rotation of the image. Not only that, you can also Flip image, if required. Once done, you can then click on Save & download button located at the bottom of the interface. It soon saves your image (after adding watermark to the bottom of the image). 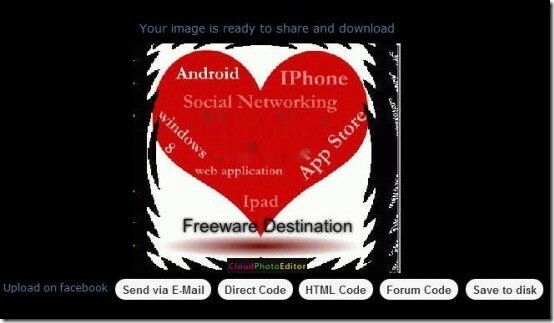 It provides various options: Upload to Facebook, Send via Email, Direct Code, HTML Code, Forum Code and Save to Disk. It downloads the image to PC in animated GIF format. Offers simple and easy interface. Offers variety of effects, animations, frames, glitter stamps, etc. Provides you famous and popular magazine covers also. Has the ability to create animated GIF slide. Has the ability to generate embed codes. Saves images to computer in animated GIF or JPG format. Cloudphotoeditor offers you variety of effects, animations, frames, etc. You may get carried away by variety of options, as I too enjoyed creating great looking animated images. Try your hands on this photo editing website using the link below. Don’t forget to share your creations and feedback in the comments below.